My husband forwarded me an email he got from Betty Crocker for some grilled potatoes. He never searches for recipes, or pays that much attention to them. So when he sent me this email, I took it as a hint. I figured the next time we grilled, I would make these potatoes! As luck would have it we had friends over for dinner just a couple days later. They were bringing chicken to grill, so I had to come up with the side dishes and desserts. These grilled potatoes were loved by everyone! This recipe would also be a great camping recipe. You could add ground beef and green peppers, and have a complete meal. If I camped, I would remember that for later. But since, I don’t, I will just make them at home! The original recipe calls for grilling them from start to finish. I didn’t want to deal with that. An hour on the grill when the chicken was going to take 15 minutes? Not for me. I par-cooked the potatoes ahead of time, so they just had to spend the last 20 minutes on the grill. It worked great, you still got the crispy ones on the bottom where the foil was hitting the grill, but done so much quicker! I will post the recipe the way I did it, but you can omit my step and just go straight for the grill if you prefer. In a large microwave safe dish heat the diced potatoes for 10 minutes, stirring after 5. 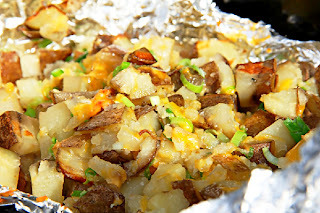 Place the potatoes a large sheet of heavy duty foil. Toss them with the olive oil. Sprinkle over the salt and bacon. Dot with butter. Wrap the foil securely around potatoes. Place over a hot grill for about 20 minutes, flipping half way. Open up the foil, and top with cheese and onions. Stir around to melt the cheese. Serve straight from the foil pack. Enjoy! I will have to remember this recipe when we fire up the grill next. Good idea to pre-cook it first. Have a great weekend! Oh yum! We always make these when we are camping. Good idea to add hamburger to it! I think that I would love this recipe..being potato lover in any form or shape sounds heavenly Erin!! Looks delicious Erin! I do this all the time when camping - I just wrap it up with extra foil and put it right in the fire - throw in onions, peppers, and keilbasa...the sky's the limit. Love potatoes! Great recipe! Yummy! Congrats on your award! I really like potato dish, and this along with cheese, bacon, and green onions sounds perfect! It's so easy yet just right amount of salt and butter make it everyone's favorite. I need to remember this potato dish! The potato...the cheddar cheese...the bacon...the grill...AND THE MAGIC IN YOUR HANDS!!! My husband love potatoes as well, and I love to grilled it, but i like your way, it would be very flavored. What a great idea! The grilling must add a wonderful smoky flavor. These sound awesome, we love grilling anything but usually roast potatoes inside...my husband is already planning to try this! This looks great...just like the blog. We're putting these ingredients on the shopping list now. Thanks! Ohh I love the idea of making these when we go camping. We're going camping in July and I've started a list of things to cook over the fire, and these would be great! Love the smoky cheddar you put in these! Thanks for linking up to our Get Grillin' event.